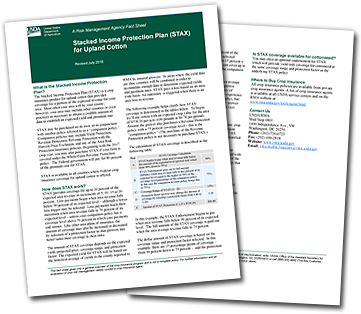 The Stacked Income Protection Plan (STAX) is a new crop insurance product for upland cotton that provides coverage for a portion of the expected revenue for your area. Most often your area will be your county, but it may include other counties or even practices as necessary to obtain a credible amount of data to establish an expected yield and premium rate. STAX may be purchased on its own, or in conjunction with another policy - including Yield Protection, Revenue Protection, Revenue Protection with the Harvest Price Exclusion, and any of the Area Risk Protection Insurance policies. We refer to this as a “companion policy.” The federal government will pay for 80 percent of the premium cost for STAX.